Although the forecast was for strong to gale force easterlies I had nothing to do on Thursday and no prospect of any blanks arriving on Friday so I packed my tench gear and headed south. It was hardly a thrilling sight that greeted me, and boy was it cold in the wind. I settled in next to the only other angler on the sheltered bank and took my time setting up. There had been a few tench coming out since my first visit but the cold wind seemed to have slowed things right down. With few tench moving I didn't pile the bait in and concentrated on recasting the feeders to put free offerings in. It wasn't until after dark, around ten fifteen that a single bleep stirred me just as I was starting to nod off. The bobbin was dropping back on the left hand rod which had cast a method feeder, rigged with the standby of two grains of plastic corn, as far as I could heave it. 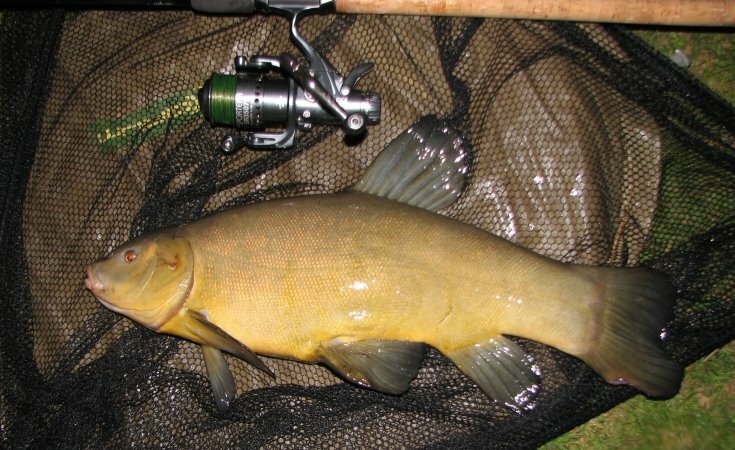 When I connected it felt like the first tench of the year, and after it had tried kiting into the next swim a couple of times I got it in the net. No monster, but nice to get that first fish under the belt. The wind showed no sign of abating and kept up all day Friday. Around tea time the angler next to me landed a tench, and just before dark I dropped a hybrid off - the bite again coming to the long-chuck method rod. Friday night continued cool, windy and fishless, as did Saturday morning. With rain forecast I packed away the gear at ten o'clock and headed home. Under the conditions I felt like I'd done reasonably well. 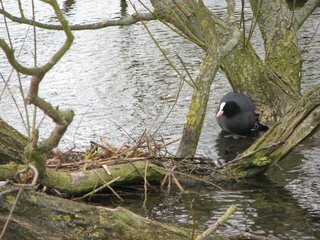 Most of my time was spent watching the birdlife; martins, swallows and terns swooping over the water, courting grebes, and a pair of coots building their nest. It really annoys me when people say anglers disturb wildlife. 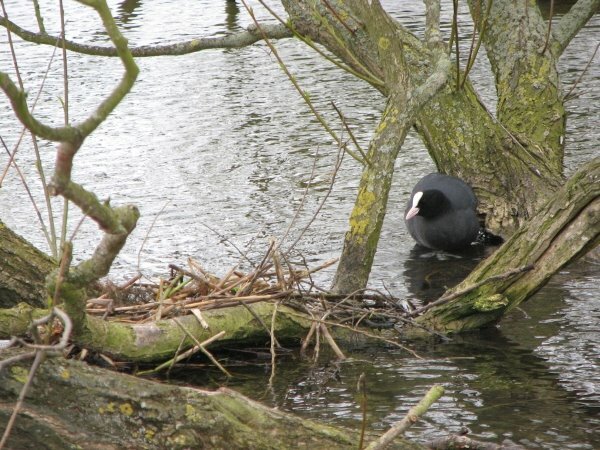 Not only did one bloke have a mole pushing up earth in his bivvy, but the coots were building their nest about thirty feet from me and I had no trouble getting closer to take a photo. When you see a good idea - nick it!